Software complex for the automated dynamic analysis of multicomponent mechanical systems EULER (EULER) developed by the specialists of JSC «AutoMechanics.Inc» with the participation of teachers and postgraduate students of Lomonosov Moscow State University. 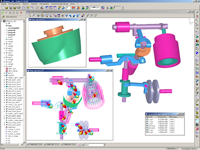 The software package is designed to analyze the operation of mechanical systems, including complex kinematics, large movements, rigid and deformable structural elements, hydraulic, pneumatic and electrical systems, control systems and other components. The original technology of automated dynamic analysis of multicomponent mechanical systems is implemented in the software complex EULER. The essence of the technology is as follows. Description of the dynamic model of the mechanical system is performed in the usual engineering terms such as body, joint – the kinematic connection of the elastic or damping element of the force interaction etc. Is a description of the model can be performed by a specialist engineer. Based on the engineering and technical description of the dynamic model, a mathematical model of the motion of the mechanical system under study is automatically formed in accordance with the concept of dynamic interaction of a set of solid and elastic bodies.the Equations of this mathematical model exactly correspond to the laws of classical mechanics, taking into account the large displacements of parts of the mechanical system and taking into account the nonlinear characteristics of interactions. Compared with the traditional approach to the study of the dynamics of complex mechanical systems, in which the "manual" formation of equations and their programming, the technology of automated dynamic analysis provides a multiple reduction in the time of creation of dynamic models of complex objects and high flexibility in their reconfiguration. 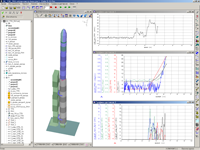 The EULER software package can be used in the design, development, testing and fine-tuning of various products, in scientific and applied research, as well as in the learning process. The program complex can be used by engineers, researchers and students of various branches of science and industry. The use of the software allows to obtain reliable information about the behavior and power loads in the created products already at the early stages of design. With the help of mathematical models, it is possible to determine the performance characteristics of new systems, optimize their parameters and conduct a comparative analysis of various design options. The software complex EULER also allows to carry out quickly researches of the emergency situations arising in the course of operation of the existing systems. As a result, the development time is reduced, significantly reduces the amount of finishing tests, increases the quality of products and reduces the cost of their creation.